Concord Country Club has a rich history dating back to the early 1900s. The Brinton Lake Club was organized in 1918. William Flynn was hired to submit a design for a 27-hole golf complex. Plans for a third nine were apparently reconsidered, as only eighteen holes were ultimately constructed. The plans for eighteen holes, par 70 and an overall length of 6,375 yards, were developed throughout September 1923, completed and presented to the club on October 8, 1923. In 1927, the name of the club was officially changed to Concord Country Club. The Brinton Lake Club, predecessor to Concord Country Club, was organized in 1918 under the leadership of Ellwood J. Turner and Frederick M. Schwalm. The vision was to provide a summer colony of cottages located on a hillside overlooking Brinton Lake. Club members would enjoy swimming and diving in the lake, horseback riding, steeplechase races, polo, bowling, trap shooting and canoeing. Sledding and ice skating on the lake were enjoyed during the winter months. The members hired William S. Flynn, noted golf course architect to design a golf course in 1923. The first nine holes were opened for member play on October 1, 1924. Play on the second nine holes commenced on Labor Day in 1925. 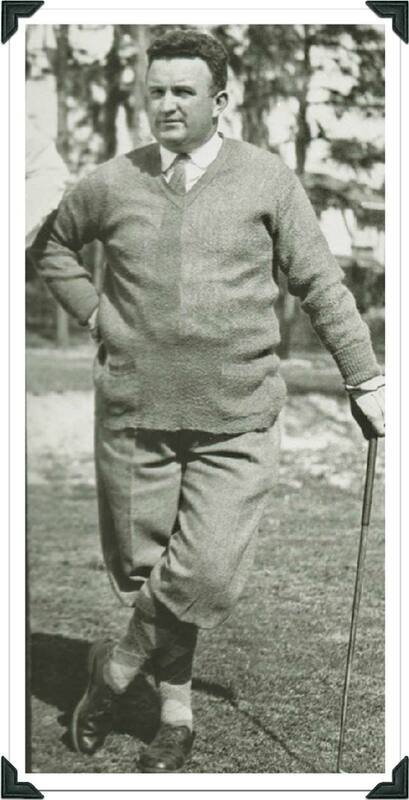 The first golf professional at the Brinton Lake Club was Mr. David Kirkaldy, a native of St. Andrews, Scotland. David’s father was the iconic Andra Kirkaldy, successor to Old Tom Morris as golf professional at The Royal and Ancient Golf Club of St. Andrews, and a three-time runner up in the Open Championship. On March 16, 1927, the membership of Brinton Lake Club reorganized, deciding to separate the golf activities from the lake activities. Concord Realty Company was formed, giving birth to Concord Country Club. The first President of Concord Country Club was Irenee du Pont, the famous American industrialist who was also a golf enthusiast. Mr. du Pont served as President of E.I. du Pont de Nemours and Company from 1919 to 1926, and served on the company’s Board of Directors until his retirement in 1958. Irenee du Pont appeared on the cover of Life Magazine on August 19, 1957, flanked by his son Irenee, Jr. and grandson Irenee III. • Lammot du Pont II, President of E.I. du Pont de Nemours and Company from 1926 to 1940, and brother of Irenee du Pont. • Henry Francis du Pont, owner of Winterthur. • Henry Belin du Pont, Assistant to the President, DuPont; Director and Secretary, General Motors; aviation pioneer. Ed Dudley, formerly of Hollywood Country Club, Hollywood, CA became Concord’s golf professional in 1929 and served through 1933. “Big Ed” Dudley was one of the top players of his era, and later became one of the most influential figures in professional golf circles. During his time at Concord, Mr. Dudley was selected to play on the United States Ryder Cup team in both 1929 and 1933, and made the team once again in 1937. He won 13 times on tour including the Western Open, often considered a “major” for players of that era. Dudley had 24 top ten finishes in major championships, including third place finishes at both the Masters and PGA. He finished 5th in the U.S. Open, and placed as high as 6th in the Open Championship. Mr. Dudley played in the Masters 14 times and posted 7 top ten finishes. In December of 1932, Bobby Jones appointed Ed Dudley to become the first golf professional at the Augusta National Golf Club. Mr. Dudley continued to serve as the pro at Concord during the summer of 1933, and split his time with Augusta National during the winter. In 1934, Dudley left Concord to become the professional at Philadelphia Country Club. In 1941, Dudley moved to The Broadmoor in Colorado Springs where he worked summers until his passing in 1963. While serving as pro at both Augusta National and The Broadmoor, Mr. Dudley was elected President of the PGA of America from 1942 through 1948. Dudley served Augusta National as their pro for the first 23 years of their existence. While at Augusta, he became the personal golf instructor for President Dwight D. Eisenhower, and his list of students included Bob Hope and Bing Crosby as well as many Hollywood stars. In 1957, he left Augusta National to work in the winter months for Laurence Rockefeller at Dorado Beach Resort in Puerto Rico. While at Dorado, Dudley became a mentor to Juan “Chi Chi” Rodriguez. Like many clubs during this era, World War II took a toll on the membership roster at Concord Country Club. On July 27, 1945, Wilmington Country Club purchased Concord Country Club. Prospective members of Wilmington Country Club were given an option of joining Concord Country Club or being placed on a Wilmington C.C. waiting list. The Concord facilities were also available to existing Wilmington members. During the 1950’s the game of golf began to grow throughout the United States, driven by the influence of President Dwight D. Eisenhower, a golfing enthusiast. Wilmington Country Club, located near Kennett Pike and Greenhill Avenue, began to explore growth opportunities. With an eye toward future growth and development, in 1951, Wilmington C.C. purchased 335 acres from Henry Francis du Pont’s Winterthur estate. The 1960’s saw dramatic growth in the game of golf throughout the United States. Television coverage of professional golf featuring personalities like Arnold Palmer led the charge. Concord Country Club was no exception. In 1960, Wilmington Country Club began construction on their current golf courses and facilities on the Kennett Pike, triggering their interest in selling Concord Country Club. Mr. Lammot du Pont Copeland purchased Concord Country Club from Wilmington Country Club on December 14, 1961. Mr. Copeland, a senior executive at DuPont, was the great-great grandson of Eleuthere Irenee du Pont, the founder of E.I. du Pont de Nemours and Company. The year after he purchased Concord Country Club, Mr. Copeland became the President of the DuPont Company and served through 1967. Mr. Copeland was highly respected worldwide for his business accomplishments, and appeared on the cover of Time Magazine on November 27, 1964. Mr. Copeland inherited a clubhouse facility that was acquired in 1923 from the Martin family. That building was located near the corner of Routes 1 and 202. Recognizing that the older facility was inadequate to handle the demands of a growing membership, Mr. Copeland began building a new clubhouse for Concord Country Club in 1964 and relocated it to its current site near the center of the club’s property. The building was dedicated on May 15, 1965, and was met by rave reviews from local media and the membership. Mr. Copeland recognized the development potential of lands located at the corner of Routes 1 and 202 and pursued a long-term strategic plan to maximize the value of the property located near the intersection. To realize the goals of his real estate plan, he would be required to purchase 18 acres of contiguous land on the northeastern side of the property and make certain changes to the golf course. He hired golf course architect Geoffrey Cornish to build five new holes (the current 4th, 13th, 14th, 15th and 17th) Mr. Cornish also shortened the current 16th from a Par 5 to a Par 4, and combined two former holes to create the current Par 5 #6. To thank the membership for their patience and understanding during the construction process, Mr. Copeland generously built an Olympic-sized swimming pool with two locker rooms, a grill and an office. The new facility was dedicated on Memorial Day weekend in 1974.
n 1980, Mr. Copeland built a tennis pavilion and two tennis courts for the membership. In 1983, the realization of Mr. Copeland’s long-term real estate plan came to fruition. He sold 45 acres of land at the corner of Route 202 and Route 1 and subsequently, those lands were developed into the current State Farm Insurance complex as well as several retail businesses. On July 1, 1983, Lammot du Pont Copeland passed away. The ownership of Concord Country Club passed to his son, Gerret van S. Copeland. In 1996, Concord Country Club expanded the tennis facility once again with the addition of two more Har Tru tennis courts to accommodate increasing interest from the membership. In 1996, Mike Moses was introduced as the Head Golf Professional at Concord Country Club. A fine player, teacher and administrator, Mr. Moses is the longest tenured golf professional in club history. The membership of Concord Country Club purchased the club from Gerret van S. Copeland in 1997. The membership of Concord Country Club approved a $1,500,000 comprehensive improvement and renovation plan for the golf course in 2000. Mr. Ron Forse and Mr. Jim Nagle, noted golf course architects, were hired to develop and implement a restoration and modernization plan. Significant improvements to the overall golf experience at Concord Country Club were realized. Mr. Forse and Mr. Nagle are students of the architectural work of William S. Flynn. The two architects worked carefully and methodically to maintain the integrity and spirit of Concord’s original Flynn design. They also took bold steps to enhance and improve the golf holes originally built by Mr. Cornish, making their appearance and playability consistent with holes that Mr. Flynn would have designed. In 2002, the membership approved an additional $1,700,000 plan to provide major renovations to the interior and exterior of the clubhouse, swimming pool, and halfway house. The architect for the clubhouse renovations was Bernardon, and the project was completed in 2003. The tennis complex grew again with the addition of two Har-Tru tennis courts, as well as the installation of lights for nighttime play. Also, the club opened a fitness center on the top floor of the clubhouse. In 2010, Mr. Sean O’Hair set the course record at Concord Country Club. A club member and successful touring professional, Mr. O’Hair shot two consecutive rounds of 62 on the very same day to set the record. Mr. O’Hair has had a fine professional career, with four PGA Tour wins and over $20 million in career earnings amassed.